VATICAN CITY (CNS) — Brazilian Cardinal Odilo Pedro Scherer of Sao Paulo, 63, heads Brazil’s largest diocese and ministers in one of the most populous cities in the world. In the city of more than 11 million people — more than 80 percent of whom are Catholic — the cardinal oversees parishes that struggle with high poverty rates, crime, youth unemployment and lack of basic services like running water. On his archdiocesan website and in newspapers, Cardinal Scherer regularly offers Catholic-based commentary on issues making the news in Brazil. He also has a very active Twitter account with more than 20,000 followers, which he uses to provide short reflections on Sundays and holy days, but also to respond to people’s questions and comments. The cardinal has not shied away from controversial topics, including criticism of some of the Pentecostal churches that have been acquiring growing numbers of adherents in Brazil, which remains the country with the world’s largest Catholic population. In an early February column titled “How Much Does the Bishop Earn?” Cardinal Scherer tried to respond to an uproar in Brazil caused by a news investigation into the amount of money Brazilians donate each year to churches and other religious organizations. He acknowledged the overall sum is “impressive,” but said it is necessary to distinguish between mainline churches — which operate parishes, schools, hospitals and other social service programs — and groups whose leaders are getting rich personally. Catholic Church law requires each parish and diocese to have a finance council staffed by qualified people to ensure “rigor, transparency and accountability,” he noted, and stressed that the government has a right and obligation to keep tabs on organizations claiming religious exemptions from taxes. Cardinal Scherer has also been an outspoken proponent of the church’s moral teaching and the Catholic identity of its institutions. In December, the cardinal wrote an article in a local newspaper defending his appointment of a new dean for the Pontifical University of Sao Paulo. He said he was proud of taking steps to strengthen the Catholic identity of the university, which “was not founded just to defend the church. Its primary purpose is to serve truth and the good of the human person,” he said. As relativism grows in the culture, Cardinal Scherer said, “a Catholic university helps to show that there are non-negotiable values such as the pursuit of truth, the value of human life in all its stages and the dignity of women.” In a society where people are calling for pluralism and democracy, the Catholic university has a right to exist and make its contribution, he said. The cardinal has firmly opposed all attempts to liberalize Brazil’s abortion laws. When the Supreme Court voted in 2012 to legalize the abortion of fetuses with malformed brains, Cardinal Scherer made headlines by asking who the court would next define as undeserving of life. Born Sept, 21, 1949, in Cerro Largo, Brazil, he also has strong ties to Rome. He studied philosophy and theology at Rome’s Pontifical Brazilian College and Pontifical Gregorian University and worked as an official of the Vatican Congregation for Bishops from 1994 to 2001. Ordained a priest in 1976, he served as pastor in the Brazilian Diocese of Toledo, and taught at and served as rector of a number of seminaries and religious institutes in southern Brazil. Named an auxiliary bishop of Sao Paulo in 2001, he was elected secretary-general of the Brazilian bishops’ conference in 2003. 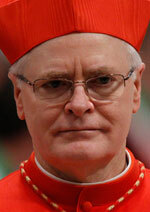 He became head of the Sao Paulo Archdiocese in early 2007 and was made a cardinal by Pope Benedict XVI later that year.